It's not every first-time playwright who gets to have their work debuted in short order at the Globe's Sam Wanamaker Playhouse, then transfer to the West End, and then come to Broadway. Of course, not every playwright carries the authority of Claire van Kampen and her long-time connections to the Globe and to (naturally) Mark Rylance. 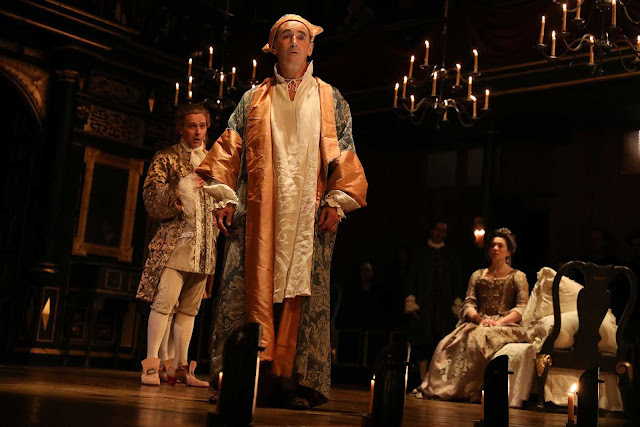 Few productions, however, rely upon those connections in quite the way that makes Farinelli and the King possible, and director John Dove takes full advantage of all the resources at hand. Photo of Iestyn Davies, Mark Rylance, and Melody Grove. Van Kampen's play is a sumptuous undertaking, one that couldn't exist without the coming together of her vast knowledge of early music, her ability to write to the strengths of Rylance as a performer, and the resources of the Globe to bring together a cast of actors and musicians to create the world of Spanish king Philippe V and the castrato sensation Farinelli. A story about Farinelli requires the music that surrounded him, and if we cannot actually bring in a castrato to sing and act the part, Dove has assembled for van Kampen's play an excellent cast of actors teamed with musicians skilled in the baroque style, including the countertenor Iestyn Davies (matinees on two-show days are covered ably by James Hall) as the singing voice of Farinelli (Davies sings for Sam Crane's Farinelli, appearing onstage for each musical interlude, and then fading back when the music ends to let Crane carry the rest of the role). The play's strengths lie in its innate understanding of the magic that Farinelli could ignite, not only from the whimsy of feathered costumes and antiquated stage effects, but also from the delight that audiences then and now receive in hearing a male soprano voice. Hearing Davies truly feels like magic, and van Kampen is wise enough to let that voice carry the audience into the world of this play. Rylance's king hears and befriends Farinelli due to the maneuvering of his queen, played by Melody Grove with devotion and loyalty. The play's weaknesses are in not quite knowing what more to harness out of this triad; Rylance stays firmly in his familiar wheelhouse, and Grove and Crane never feel as though they have been given quite enough to work with. Other characters in the play never escape paper-thin superficiality. A sudden love scene late in the second half for Grove and Crane feels like a strange misstep, until Davies steps forward as Crane retreats, breaking the rules established by van Kampen and Dove, and sings the heartwrending "Cara sposa" from Handel's Rinaldo. When the music and the performances of Grove, Crane, and Davies are set free of the text, all the ache of Handel's music rises to fill the theatre and imbues the scene with the heartache that plays across Grove's face as she watches Crane walk away. It's a beautiful moment, played out on a candlelit stage that is somehow even more lovely in person than I ever anticipated. 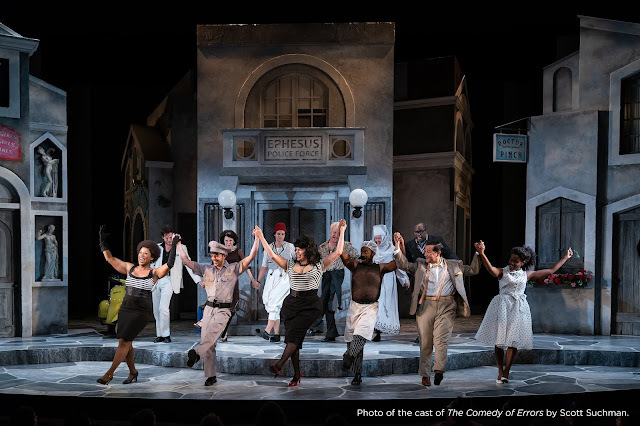 In scenes devoid of the music, the play can never reach those heights, but there is so much that it does understand and can share with audiences. Rylance's performance is as tender and vulnerable as ever, and the evening feels like we are being granted access to a world that doesn't quite exist any more- we have one night to dance on the faerie hill before we go back to the real world, and now certainly seems like a time ripe to escape to something beautiful.